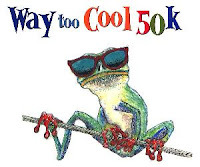 The first true test of the 2009 season is drawing close: registration day for the Way Too Cool 50k. So limber up your fingers, keep your credit card close, and be sure to get a lot of rest. The 2007 race filled in seven minutes; 2008 filled in just over eleven. Online registration opens at 8:00 am PST on Sunday, December 14. Details will appear on the Way Too Cool website. The March 14, 2009 event takes place in Cool, Ca (not far from Sacramento), and is run on part of the Western States 100 trails. Course records are held by Uli Steidl (3:18:17) and Susannah Beck (3:55:22). Postscript: (12-15-08) Scott Dunlap reports 2009 race filled in just under 9 minutes.